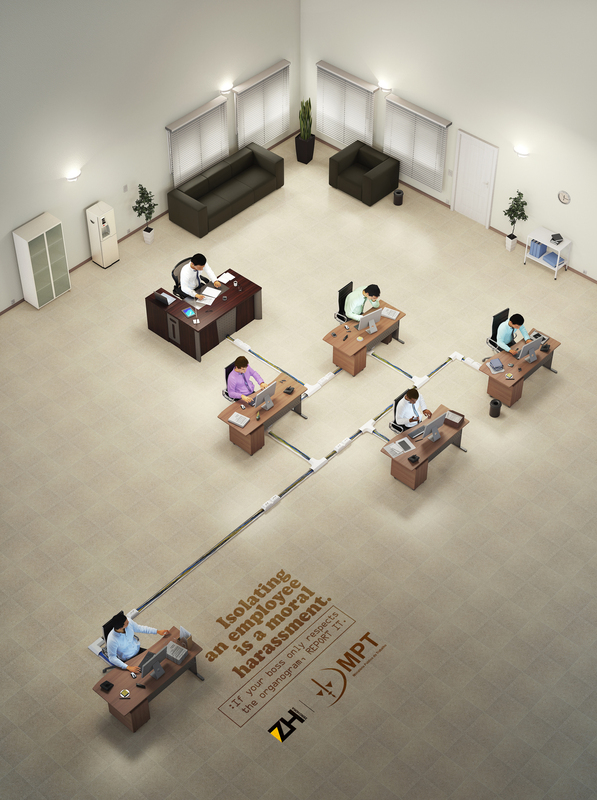 The Ministry of Labour in Brazil has launched a powerful print ad campaign to fight harassment at work. The workplace is one of the most important social space where people spend a lot of time. It is essential that companies should create friendly work environment, so that employees can be effective and productive and enjoy what they are doing. A positive workplace is characterised by respect that supports employee engagement. It also creates a high performance culture that encourages innovation and creativity. Engaged employees are considered to be more motivated and committed. People who are harassed may suffer distress, anxiety, depression and other serious psychological problems which make them feel unhappy and hate the thought of going to work. They lose confidence. All these affect their work productivity. People make mistakes due to their lack of concentration and motivation. 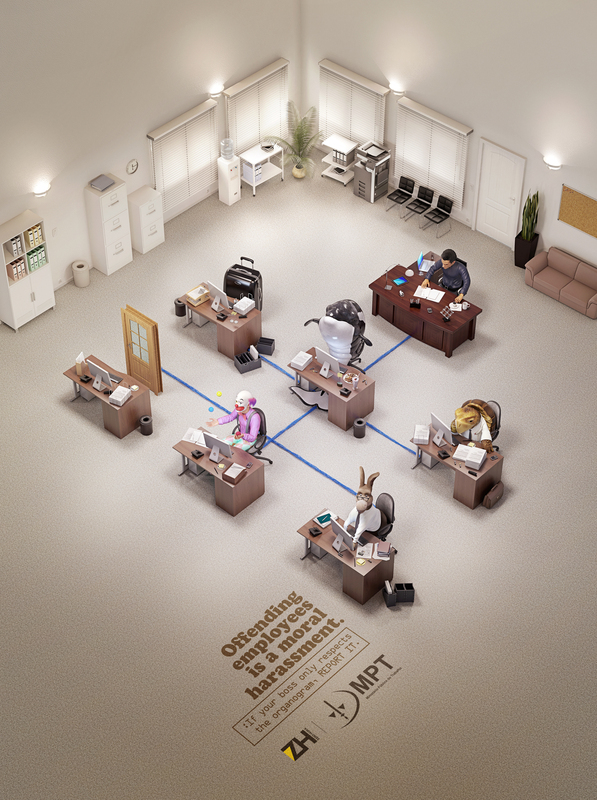 The Ministry of Labour in Brazil in collaboration with ad agency Escala has created series of print ads aiming to prevent negative work environment and harassment. They also focus on attracting public interest to the problem. 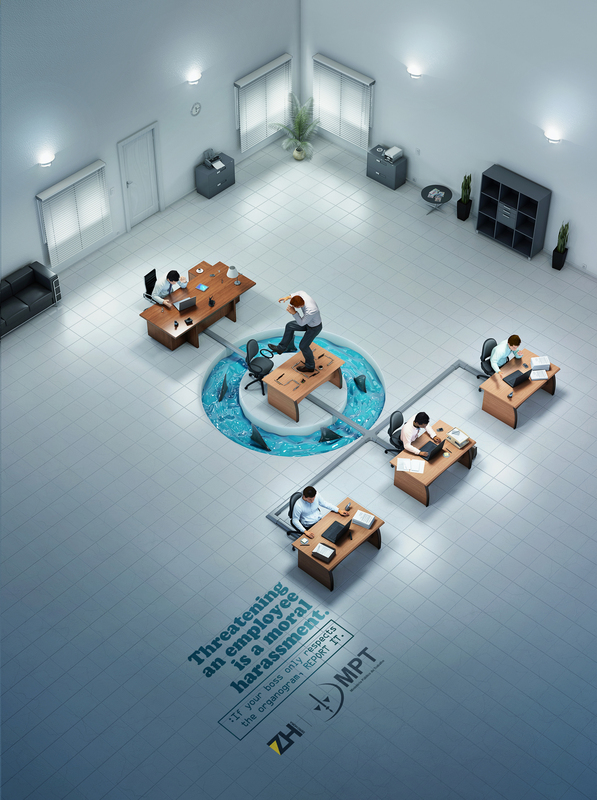 In all ads work space with an employer and employees accompanied by powerful messages are shown. There are different types of moral harassment that can occur in the workplace such as isolating, threatening, minimazing the potential of employees and offending them, calling them by nicknames like door, briefcase, whale, turtle, donkey and clown. 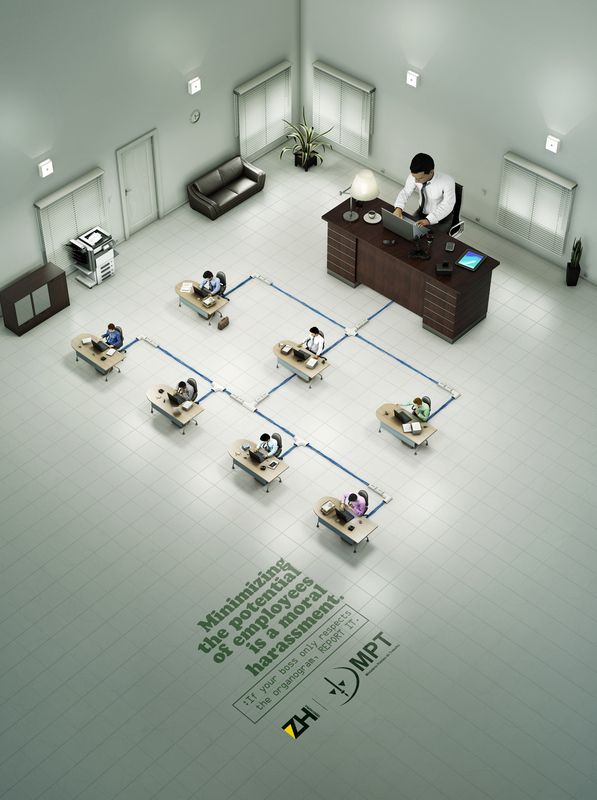 At the end of each ad you can see a message “if your boss only respects the organogram, report it”. It means that if you are harassed or bullied and your boss says nasty things and uses physical violence you should defend your rights and contact an employment lawyer immediately. He can help explain the law and assert your rights in court if needed. Are you ready to speak in color? Yet another reason I am glad I have not worked for someone else for over 10 ears ! I like these ads. They tell people how to respect each other. I was just discussing this subject with a friend a few weeks ago. She didn’t see her work environment as harrasing, but I think she does now. We all need to learn to respect each other and be appropriate in and out of the workplace! Anything that raises awareness is great in my book! Thanks for the interesting read!! Anything that raises awareness is great in my book!! Great read thanks!! I’m shocked it’s that much of a problem that this is necessary. That’s very sad! I guess you don’t stop to think about other countries and how they are developing but I am happy that there are programs being developed to ensure a harassment free workplace. I’ve seen this ad last year and it really blew my mind. I didn’t think of harassment that way but once you realize it, that’s really how it works in an office. It’s an eye-opener. Very nice. I think this would work great for a corporate environment. The ads do work. There definitely are all types of work place harrassments. Its more previlant than we think and we need to work on it as a society. I guess I’m lucky that I don’t have a boss in my work. Still a great ad! I’m lucky I work at home now. I hate workplace antics. I had a job once where it seemed more like high school than a business. Too clicky! Wow this is a different perspective of harassment! And there are so many more ways there are subliminal harrassment in the corporate world. So happy I freelance now and away from these things! Well there is also a difference between “boss” and “leader”. And this post describes my first boss. Couldn’t do anything about it though. All the more reason to be your own boss. It’s a shame that people have to use such tactics to belittle others. This is a great campaign. I’ve never thought of harassment this way. I hope it raises a lot of awareness. Everyone has their own right so as employees and this is a good way for all employees to be aware of their rights! Thumbs up for this! Being harass while working is tough. We will need to be careful and sometimes we need to fight back if we have too. There are some bullies at work. This is an amazing awareness campaign. Workplace is the place, where people spend most of the time of the day. Harassment in workplace may lead to a lot of serious concerns as mentioned here like depression, anxiety, which may further lead to nervous breakdown as well. People spend such a long time in these environments, so this is a wonderful campaign for employees. What an interesting campaign. I’m sure a lot of harassment goes under the radar, especially in large companies. It’s good that they are getting the word out to stop it. That is a really interesting campaign! I like the different images they have and how it can be harassment. You’re welcome! Glad you liked it 🙂 Thanks for your feedback! Those other types of harassment sound more like bullying to me. It’s amazing how stuff like this can happen in an adult, professional environment. Goes to show you just how shallow many people can be. LOL what an interesting idea to fight harassment.